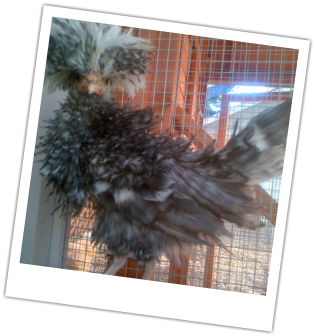 How can you not fall in LOVE with a tiny bantam polish? With their stunning plumage--these birds are show stoppers! 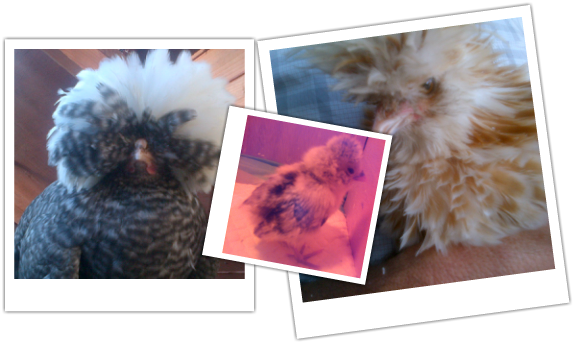 Its very interesting to watch them develop- from wirey little chicks into gorgeous grown chickens. 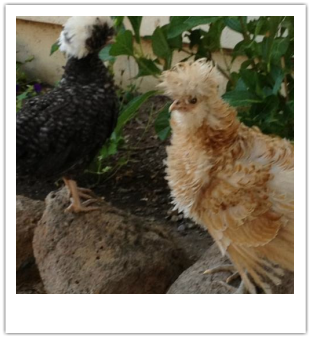 Of course, this is a bantam breed, so they will never be any larger than 3.5 pounds or so-half the size of the standard large breed Polish chicken. their crest "top knots" are just too big! peripheral vision but are especially vulnerable to predators. making slight "coo-ing" sounds of happiness. We have found most Polishes to be very friendly and non-aggressive. Little chicks enjoy spending time on your lap or nestled up near your neck for warmth. Grown hens and roos can be held and stroked like beloved pets. 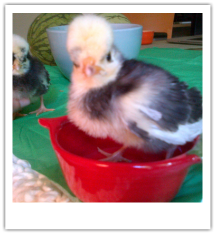 When well-socialized as chicks, they grow up to be very fun & entertaining additions to your flock. 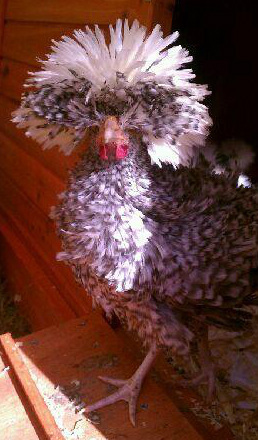 You may be wondering, WHAT is with this frizzle thing? This is a genetic trait, passed on through specified breeding. A bird is born frizzled feathered-- or smooth feathered. They will not "become" frizzled later on. 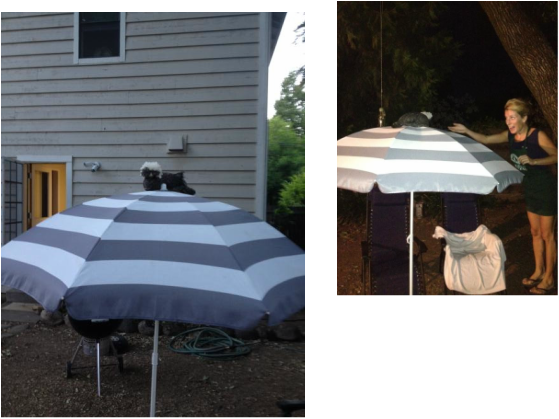 This is why you trim their wings--- ViVi loves to perch on top of the patio umbrella! I have to stand on a chair to coax her down at night for bedtime. "Freckles" a cuckoo frizzle is an example of how vulnerable small Polish chicks can be (and all chicks for that matter) to any kind of predator. She was "abducted" by a neighbors cat in the backyard, in plain view. She was the easiest victim, oblivious to everything. She was taken over a fence, into another yard, & played with by other cats before I could find her. 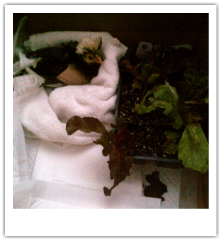 Her right wing was severed (practically removed) --very icky. *I am sharing this sad story because I don't want anyone else to go through this. In my opinion, Polish just need a little bit more supervision than other poultry. "Freckles" is alive & well. 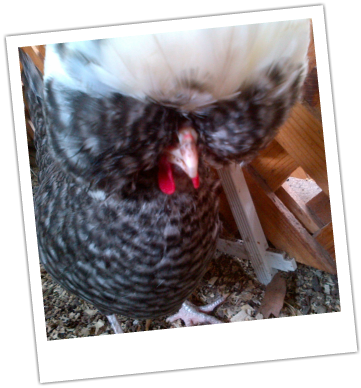 She is a healthy hen now, but she will never fly- her wing droops towards the ground. I felt so guilty that I spent my Christmas fund for her emergency care! She is not even grateful! She's a chicken.